Stanley Culpepper has spent most of the last decade fighting a monster. In 2004, a farmer spotted palmer amaranth, also known as pigweed, invading his cotton fields in Macon County, Georgia. Given that almost all cotton grown in the state is genetically engineered to be resistant to glyphosate – the main ingredient in Monsanto’s Roundup herbicide – palmer amaranth’s creep into Georgia cotton fields meant the weed had built up a resistance as well. And soon, palmer had spread across the state. The tall stems – Shaquille O’Neal tall – can wind into the gears of mechanical farm equipment and stop them in their tracks. The task of defeating palmer fell to Culpepper, the state’s foremost weed expert, who refuses to refer to palmer by its superlative nom de guerre. “I call it a special weed,” Culpepper says. In the last decade, palmer amaranth beat “the moral crap” out of Georgia’s cotton growers, says Culpepper, an extension scientist and professor at the University of Georgia. Just a few years ago, every cotton field in Georgia was a nightmare, he says, a bad dream that’s since spread across the country, covered heavily by the media as yet another blow against Monsanto and biotechnology. Palmer thrives in the dry heat created by drought, and Georgia is only now pulling itself out of a continuing drought that stretches back to the 1990s. As drought parched and pummeled south Georgia crops, palmer’s seed-spreading ferocity – female plants pump out over 400,000 seeds – flourished. One of the less publicized aspects of the battle between cotton farmers and palmer amaranth has been the effect on “conservation tillage,” a soil cultivation method that leaves residue from the previous year’s crop in place to reduce soil erosion and runoff. Following the introduction of GE cotton in 1996, Roundup became the go-to herbicide for cotton growers across the country. Since GE cotton fended off boll weevils and other pests, and Roundup took care of the weeds, farmers could adopt less destructive soil practices than “full tillage,” which overturns the soil after every growing season, killing weeds but harming soil health. By 2000, 109 million acres, not just cotton, had been converted to conservation tillage across the country. But as palmer threatened more acres, and therefore profits, conservation tillage was soon thrown under the harvester. Given the choice between conservation and saving yields, the choice was clear for Culpepper: “We had to save the family farm.” Fields en masse were tilled under to kill palmer seeds. 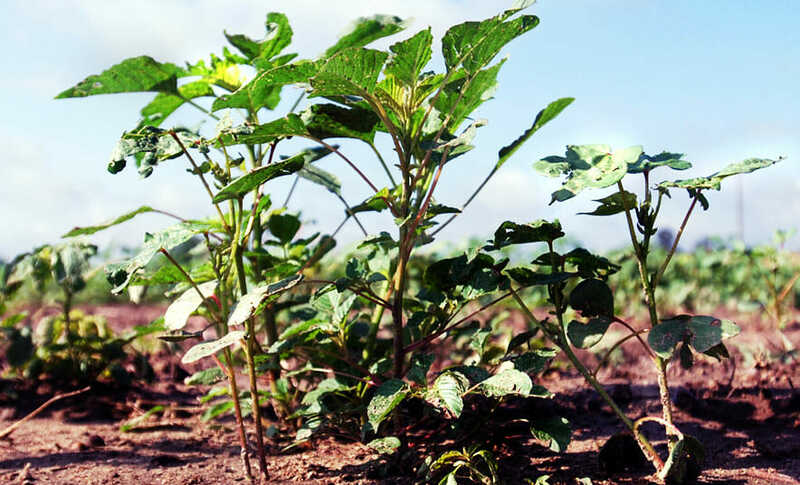 Pigweed begins to tower over cotton plants as a University of Georgia researcher measures plant height in the background. Stanley Culpepper walks through an experimental field of cotton overrun with pigweed. 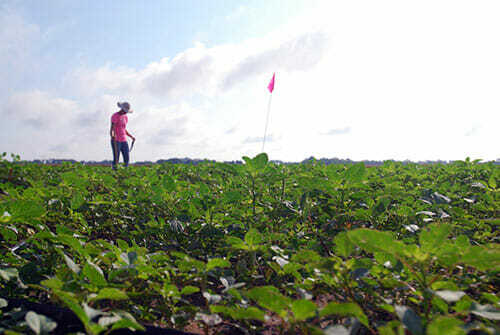 Stanley Culpepper and a research assistant measure cotton plant growing as part of an experiment. Post-palmer numbers are less than 40 percent. On top of tillage, farmers increased the amount of herbicides used on their crops. Before palmer, herbicide costs hovered around $25 an acre. In palmer’s wake, that amount increased to $100. In addition to the $15 million spent on labor to hand-weed rows of cotton, Georgia farmers spent well over $100 million fighting one weed in one crop. Adopting organic farming methods may seem a likely response to herbicide resistance, but no cotton grower in Georgia has yet sowed organic seeds – perhaps smartly so. Weevils and weeds find comfort in Georgia’s sweltering humidity. GE seeds, conservation tillage, pesticides and herbicides are all tools Culpepper sees as necessary to keep cotton farmers productive. When it comes to sprays and GE seeds, he trusts what his colleagues in the EPA tell him. “I don’t want to remove a tool,” he says. At least one organic grower in Texas, a state with a large organic cotton contingent, can understand why no one in Georgia has transitioned. “Georgia has more weed and insect pressure than Texas,” says Jimmy Wedel of Wedel Farms, part of the 19-member Texas Organic Cotton Marketing Cooperative formed in 1993. 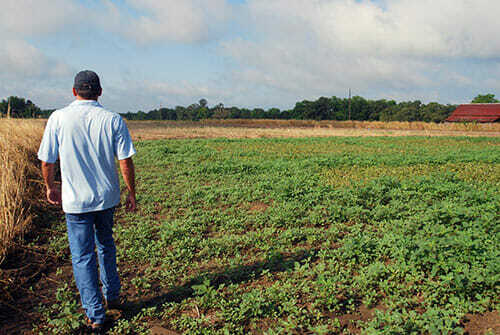 Weeds like palmer are a problem for Texan cotton-growers, but a solvable one. The dry land around Lubbock where most cooperative members farm is more conducive to organic production than Georgia’s humid climate, which invites pests. In the few times palmer amaranth sprouted up in his 800 acres of organic cotton, Wedel weeded it easily by hand, nothing near the multiple farmhand endeavor hand-weeding requires in Georgia. Still, despite a favorable climate, he estimates organic cotton makes up less than one percent of the amount grown in Texas. In California, palmer amaranth is becoming a problem – but the weed’s spread through the Southeast served as a warning to growers out west, and growers hope they’ve cut the weed off at the pass. With the help of the Sustainable Cotton Project, many California cotton growers have reduced their herbicide and pesticide usage by 70 percent, though only one grower still grows cotton organically, says Marcia Gibbs, SCI’s executive director. The initiative’s goal is a cleaner cotton, a significant reduction of the most harmful pesticides and herbicides used in cotton production. Unlike Georgia, only about 122 acres of California cotton grow in a no-till, conservation tillage program, says Jeffrey Mitchell, a cropping systems specialist in the University of California’s extension service. Developing a conservation tillage system is in the “embryonic stage,” he says, though farmers are implementing various rotation systems. “What we’re trying to do is develop a long-term system that relies on little soil disturbance,” he says. Pigweed begins to grow tall in an experimental cotton field in south Georgia. Pigweed can reach seven feet in height. 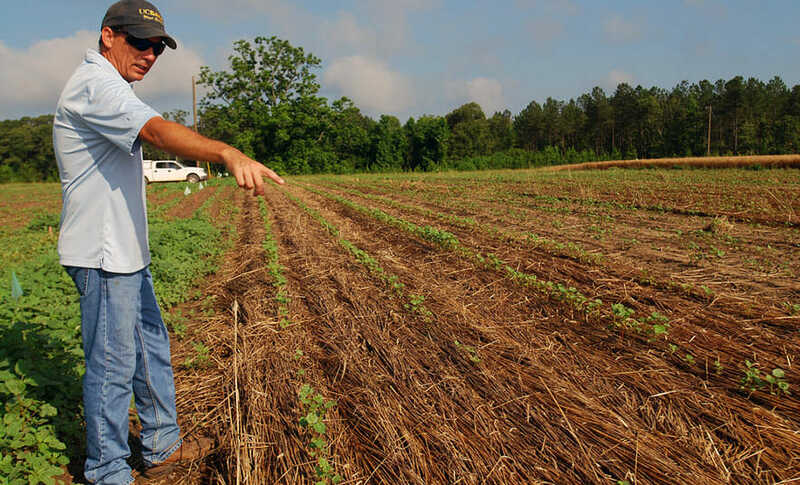 Back in Georgia, Culpepper returned to the Macon County acres where palmer first sprouted to run a few experiments in hopes of reducing the amount of herbicides being sprayed on Georgia cotton. Culpepper, though, is clear to note that his reasons for doing so are purely economic. As always, he walks a fine line – advocating for methods that, to some, may seem borrowed from the sustainability camp, but his main concern is always the farmers’ livelihood. Here in Macon County, Culpepper has been testing a decades-old Brazilian conservation method called rolling rye that he says can reduce herbicide use to $8 an acre. Here’s how it works: a farmer sows tall rye over the winter. Before cotton planting, farmers “burn down” the rye by spraying it with glyphosate, then roll it over onto the soil. The heavy rye locks in moisture and shades out the sun, creating an environment that cotton loves, but palmer hates. So far, only a few farmers have adopted rolling rye methods. Culpepper says rolling rye represents a culture change among south Georgia farmers, and he believes he’s five to seven years out from seeing farmers incorporate rolling rye to any degree.